Have you ever held a piece of turmeric root in the palm of your hand? This brown-skinned tuber looks a lot like ginger – until you cut it open. There you will find a bright orange flesh that is key to its extensive healing properties. If you've never seen fresh turmeric root before, I encourage you to start shopping for it, as it's becoming one of the most studied anti-inflammatory spices. The reason I include this golden root in my diet is – you guessed it – for its amazing anti-inflammatory properties. As I state in my book, Meals That Heal Inflammation (MTHI), "Natural anti-inflammatory remedies like the ones described in MTHI reduce the pain without the side effects because whole foods are loaded with nutrients that work synergistically to support the body’s natural healing processes." Curcumin, the active ingredient in turmeric, works by stimulating your liver and gall bladder to do the essential work of bile production and the release of gastin, secretin, gastric wall mucus and digestive enzymes. At the same time, turmeric decreases intestinal spasms and ulcer formation. Studies have found curcumin reduced symptoms of bloating and gas in those suffering from indigestion.1 It is also beneficial at decreasing symptoms associated with IBS and acid reflux, and turmeric improves IBD. As a digestive aid, turmeric is one of the best, actually protecting your GI tract through its anti-inflammatory effect. 2. 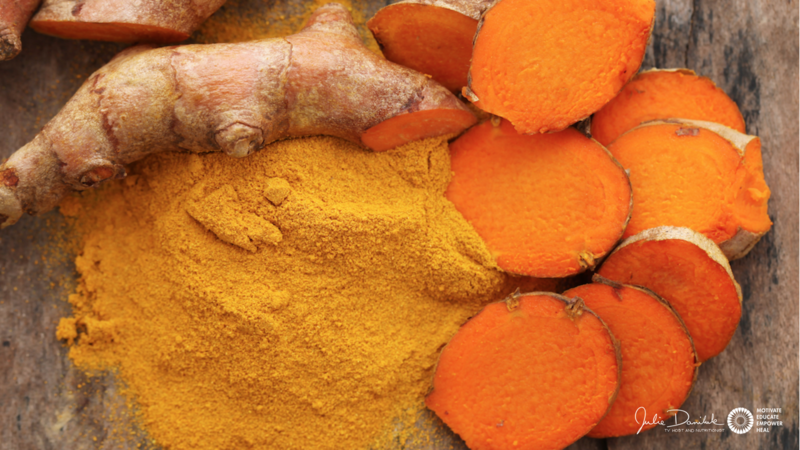 Turmeric improves circulation and supports heart health. Turmeric helps to thin, invigorate and move your blood.2 Turmeric's ability to support your liver while you cleanse your lymphatic system makes it an ideal herb for spring cleansing (along with beets and dandelions). Numerous reports find the root cause of most cardiovascular diseases to be inflammation and oxidative stress, as it contributes to atherosclerosis and risk of blood clots. 3. Turmeric is a leader in the field of anti-inflammatory herbs. Turmeric has been used for 4,000 years to treat a variety of conditions and studies show that turmeric may help your body fight infection and reduce inflammation.3 Because of this, it is great at decreasing your risk of cancer by inhibiting tumours and improving the function of your immune system. Turmeric can help you stay active by decreasing inflammation in your joints and help you improve your digestive tract by treating conditions such as IBD. 4. Turmeric is a powerful antioxidant. Turmeric scavenges free radicals to reduce (or even help prevent) some of the damage they cause in 2 ways – it acts as an antioxidant and increases anti-oxidative enzymes in your body.3 Talk about free radicals taking a double hit! Oxidative stress, like inflammation, is at the root of many of today’s prevalent chronic diseases and plays a role in the aging process, so ingesting more antioxidants is a fantastic way to promote health. Researchers are discovering that curcumin can act as an effective anti-depressant.4 A study has found that curcumin was as effective as fluoxetine (anti-depressant medication) at decreasing major depressive disorders – and had fewer side effects. Curcumin’s anti-depressant action comes from its role in increasing serotonin and dopamine. 6. Turmeric is effective for treating Alzheimer’s Disease. Alzheimer’s Disease is a neurodegenerative condition that involve both inflammation and oxidative damage. There is much evidence to support the use of turmeric for this condition because of its antioxidant and anti-inflammatory effects.5 Curcumin decreases oxidized proteins in the brain and prevents cognitive deficits and amyloid plaque accumulation. One possibility is to make a tea, which is wonderfully nurturing and nutritive with warming, invigorating and relaxing properties. In a pint-sized canning jar, place a handful of dried lemon balm leaves, several crushed rosehip and a few slices of fresh turmeric & ginger root, Pour just-off-the-boil filtered water over the herbs. With the lid sealed, brew for four (4) hours under a tea cozy or wrapped in a towel. Strain and enjoy as is, or with a bit of raw honey. Note : My recipe calls for fresh turmeric root (as opposed to the dried spice). The root contains natural oils, which will enhance absorption and bioavailability. If you are using dried turmeric powder, many practitioners would recommend a pinch of black pepper to increase the bioavailability but it is also known to be inflammatory. In general, I do not recommend black pepper for most of my clients as it can cause bowel irritation. Did you know that ginger is also a catalyst and has a similar absorption boosting capacity so just add some dried ginger instead of black pepper if using dried turmeric. 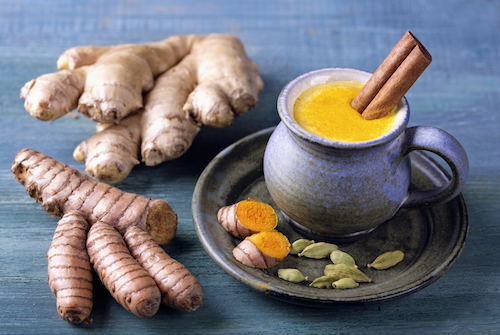 Try my Turmeric Golden Milk recipe!